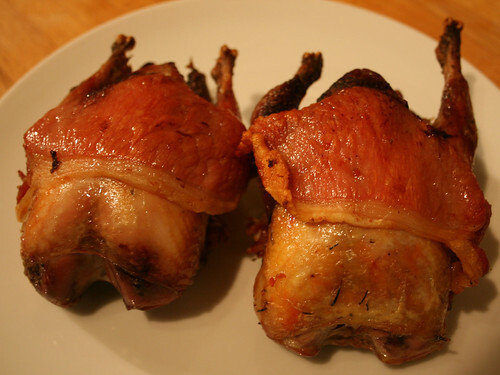 I’ve found a good source of game birds from this small Kentish farm shop and I’m very much enjoying trying different ones. 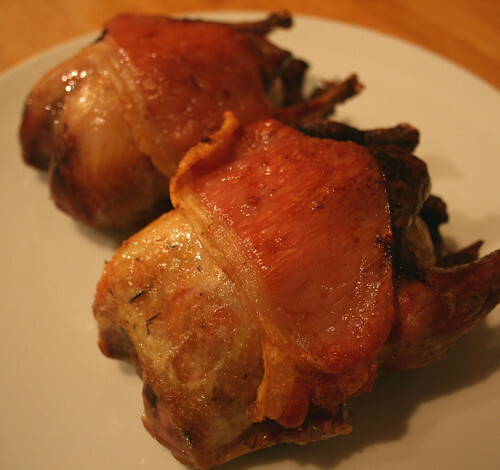 I picked up two partridges on my last visit which I stuffed with butter, garlic and shallots, wrapped them in bacon and roasted them in a hot oven. And oh my, they were good. Don’t let the small size fool you; these tiny little birds are big on flavour. If you haven’t tried partridge before you really must; and you’re in for a real treat. 1. Remove any internal organs from the birds. 2. Put a knob of butter, a garlic clove and a shallot into the cavity of each bird, and then wrap a rasher of bacon over each one. 3. Roast at 230c for 30 minutes, or until the juices run clear, turning them over half way through cooking.